Suicide prevention is a major goal of the Public Health Service of the US government. This has been the case since the 1960s when the National Institute of Mental Health established a center for the study and prevention of suicide. Since then, however, the knowledge and research gathered has not bought about the reduction of suicide. 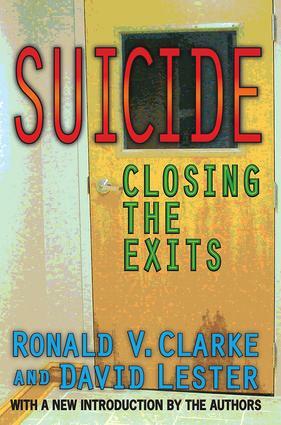 Suicide: Closing the Exits was written to change this trend. This book reports a program of research concerned with preventing suicide by restricting access to lethal agents, such as guns, drugs, and carbon monoxide. It may seem implausible that deeply unhappy people could be prevented from killing themselves by "closing the exits," but the idea is not a new one and has been discussed widely in the literature. The authors argue that restricting access to lethal agents should be considered a major preventive strategy, along with the psychiatric treatment of depressed and suicidal individuals and the establishment of suicide prevention centers to counsel those in crisis. Suicide represents a major contribution to the literature. As such, it should be read by all medical practitioners, policy makers, and psychologists.